Rules of the house, from a dog's point of view. If you aren't 6 weeks old and cute, it's tough. However there are a few tricks. Don't jump and act silly, there are some humans who prefer someone nice and quite. After they attach to you, you can start the silly stuff. If you have big feet, hide them! Look as small as possible. If the try to play with you, give them a lick and a tail wag, but remember to look pitiful. The cheaper the toy the better. Expensive store bought toys are OK if nothing else is available. However the human's belongings are much better. The cat's toys are more fun than yours. Using the cat as a toy is even better. Play time should be when the humans have no distractions, I prefer midnight. More is better, after all we need our energy. Dog food is OK, but human stuff always tastes better. If they give you something with catsup on it, or any thing else messy be sure to carry it to the carpet to eat. If the human forgets to make you a dish of your own, simply sit, and give them the saddest look you can. Humans can't resist those big brown eyes. Never, jump or try to steal. If you do they get mad and won't give you anything. Being cute always works. Know which one has the soft heart, always give them an extra lick and a tail wag to say thank you. They come through when others refuse. Store bought treats aren't bad, if you like fake bacon, dried out meat, or meat flavored rocks. I prefer sweets, banana cream and pastry are one of the best foods around. Accidents - Always make sure you have a good excuse! Sorry about your seat. I was just so excited to see you come back. You forgot to walk me before you put me in the car. It's raining outside, and you didn't want me to track in any mud, did you? That vacuum cleaner scared the ____ right out me. Remember all that water I drank last night, after you took me for a run? The TV - let them know if they don't walk you NOW, they will be cleaning up a puddle. The phone - barking sometimes works, but requesting a walk always does. The computer - Chase the cat, until it runs and jumps on the keyboard. If they are online, eat the phone cable. Another human - Get between them and lay down on your back, or place your head in the one with a soft heart. If the human is a visitor, show them all of your toys, including the ones you don't even play with. Grab something out of the laundry basket, and run through the house with it. Chewing is a nice past time. Save the "chew toys" for when the humans are looking. The real fun stuff is things like shoes, chairs, table legs, and most anything else you mouth will fit around. Empty the laundry basket, lots of neat smelling stuff there. Check out the garbage, they might have accidentally tossed out something good to eat. Do what they ask when no one else is around, the do the opposite if another human is watching. This is especially important when they take you to class. If they tell another human that you never do something like chew on hands and legs, do it right then and there. Be selective to where and when you relieve your self. Trust me they will wait. People stop calling you a "Cute puppy" and say either "Pretty dog" or "Does he bite?". The cat rates higher than you. It takes more work, to get people motivated to play or walk with you. You can't get by doing some of those fun things, you enjoyed so much. You can't remember the last time, you fitted on the human's lap, with out hanging off. You don't have to jump or climb to reach anything. By now the clothes hamper has been moved, or they have convinced you it's off limits. It is time to develop new skills. By opening the drawers, you can find a whole new stash of clothing to chew on. Learn to read labels, leave the cheap stuff for last, start with items that say Victoria's Secret or Bali. Ladies silk is always better than men's cotton. While you are not allowed to chew on computer and phone cords, you can still trip over them and disconnect them. They always say "off" when you place your feet on the table, however if you are tall like me, you no longer have to reach up. Look for stacks of paper, some humans call it mail, while others call it bills. Great stuff to chew on, be sure to put some away for later. If you are lucky enough to find a pair of unguarded shoes, be sure to hide the one you aren't chewing on. For some reason if a human finds one shoe, they automatically know that you have the other one. Last but not least win the cat's friendship. I may have been born of a breed that hunts lions, but a five pound cat sent me to the vet. Not to mention they can get on top of the refrigerator and toss down treats you can't reach. You would think that humans would be smart enough to know that dogs have different likes and dislikes just like they do. However this is not the case. 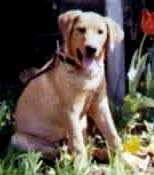 When Rusty started writing his page he was a 5 month, old 40 pound "Pound Puppy" He was surrendered to the pound, at approximately 15 weeks of age. Lucky might have been a better name for him, for he came as close as you can get to being put to death. Having been pulled from the run, placed on the table to be injected, he was given a 48 hour extension on life. He adopted us 24 hours later. He has a delightful attitude on life, living for the moment. As to his looks, well if you mixed a lab and hound dog, with a little german shepherd on the side you would have Rusty. On the other hand, there is now a little more to the story. When we adopted him March 27, 1999 he was labeled "Lab X". After months of taking out in public more than one person asked if he was a Rhodesian Ridgeback. Then there was the man, who started telling me in detail why the thought Rusty was a RR. This started a quest, sure enough there is a strong possibility! The final decision is Lab/ Ridgeback/Redbone mix. His coat texture and tail are thick like a Lab, his howl is that of a Redbone, with the personality of a Ridgeback. When we first adopted him his coat was a solid burnt orange, then is went to more strawberry, to reddish brown. He also developed a small white patch on the chest, and a little dark tip on the tail, much like many ridgebacks. As to personality now ten months old......well let me put it like this if you looked up the term "couch potato" you would find his picture. Most of the day he lays on the couch watching TV, only leaving it to bum a snack, or let me know someone is out side. He has become VERY protective of me, anyone who approaches with something in hand or that I don't speak to is greeted with a growl and hackles showing from the of his head to the base of his tail. He loves to go out and play!! At the first sign that he may get to go outside starts a routine of jumping and dancing along with a lot of talking and a few howls. Of course words can't do this funny sight justice, just vision a 60 pound dog, jumping in circles with all four feet off the ground, than changing directions and doing the same standing on his back legs. Once outside, important business is done first, then a fast pace walk for a block or two, then he shows his other trait. If other animals are out he will notice them and start howling, if none are seen the nose goes to the ground looking for a scent to track. I'm not always sure who/what he is tracking but almost every night we end up at someone's door or car.